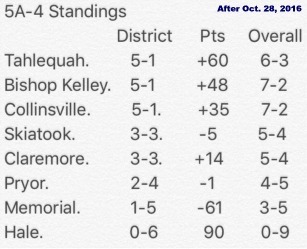 With The CHS Football win over Claremore, Collinsville can have a home game in the first round of playoff if they beat Skiatook next week. 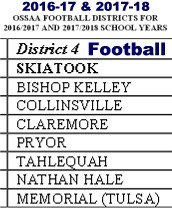 If they win and also get help with a Tahlequah win (over BK) next week, Collinsville would be district champs. Claremore scored first on a 71 yard run - Collinsville countered with a 10 yard Boomer to West TD pass. Claremore went up a score again converting a 4th and 20 from the 23. Levi Draper took the ball away from a Claremore runner and scored to set up the 14-14 half time deadlock. Collinsville appeared to have a safety on the first play after a Boomer punt pinned Claremore just inches from the goal in the 3rd quarter ... but the officials spotted the ball outside the endzone. Collinsville used the field position to score next with a 3 yard Russell TD run (set up by a 32 yard pass to West). Collinsville used a short field again on their next score which came on a reverse to Erickson who passed to Seth Boomer for the final TD. Weiser kicked all the extra points in the 28-14 Cardinal win Friday Oct. 29, 2016. 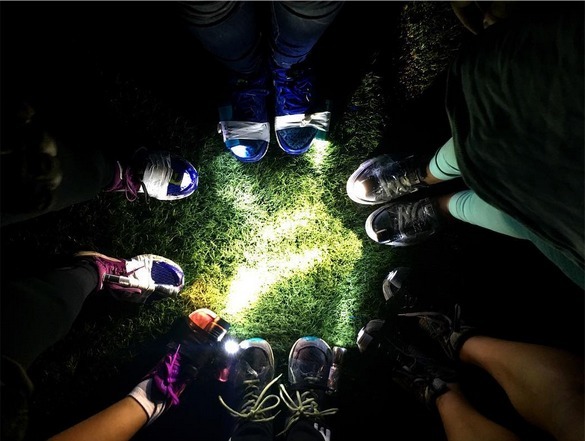 -- The cross country seniors were already gone for their state meet Saturday. Collinsville had the ball first and drove from their own 20 to Claremore's 29 before losing a fumble. Claremore struck quickly with this 71 yard run around end for a 0-7 score at 7:22 in the 1st quarter. Collinsville countered with a 74 yard scoring drive on the next possession capped by this 10 yard TD pass from Seth Boomer (#12) to Hayden West (#33 below). After the Hayden West TD reception, Seth Weiser kicked the first of his 4 extra points to tie the score at 7-7 with 3:43 remaining in the first quarter. Claremore had the lead (7-14 after converting on 4th and 20 with a TD pass at 9:57 in the 2nd) and the ball (after stopping Collinsville and Seth Boomer's punt to the 13) ... but Levi Draper (#10) stole the ball and their momentum to tie the score at 14-14 at 7:22 in the 2nd quarter. A Claremore runner had run into a swarm of blockers and tacklers going one direction but Draper stripped the ball and popped out of the scrum headed the other direction and just had to get by the surprised Claremore QB's tackle attempt for a 13 yard fumble recovery/return. A Hayden West (#33) 2nd quarter run at mid-field. Malcom Tillman (#24) with a 2nd quarter carry. Collinsville had opportunities to take a half-time lead but incompletions and penalties sent the teams to the locker room still tied at 14 each. The Collinsville Cheerleaders changed outfits and performed a half-time routine featuring their 4 seniors. The Collinsville Crimson Cadet Band performed their 2016 "Espana" marching routine for the very last time (with the light turned off) at Sallee Field. This is the traditional light show at the final home game and the Cadets have also completed a successful contest schedule with the program. Collinsville's defense shut down / shut out Claremore in the 2nd half to take control of the game. In the 3rd quarter a line drive Seth Boomer punt pinned Claremore less than a foot from their own goal. On their first attempt it appeared Collinsville had trapped them in the endzone for a safety but what I'll call a "generous" spot (below) had them with the ball still just outside the endzone. Claremore failed to gain more than a few yards and punted from their end zone with Hayden West making a fair catch at the Claremore 28. Dylan Russell (#3) put Collinsville in front for good with this 3 yard TD run at 5:15 in the 3rd quarter. Weiser's kick made the score 21-14. Coach Kevin Jones watched as red Cardinals were flying around making the stop on Claremore Zebras. The band was prepared for Halloween with their costumes that were hard to see during the light show. Collinsville scored their final touchdown from about 8 yards out on a Levi Draper pitch to Brett Erickson on a reverse then Erickson passed to QB Seth Boomer in the end zone (below). Seth Boomer (#12) scored at 6:11 in the 4th quarter on a pass from Brett Erickson. Weiser's kick set what turned out to be the final 28-14 score. Dylan Rusell (#3) sealed the deal with this interception of a tipped Claremore pass with 4:44 left in the game. 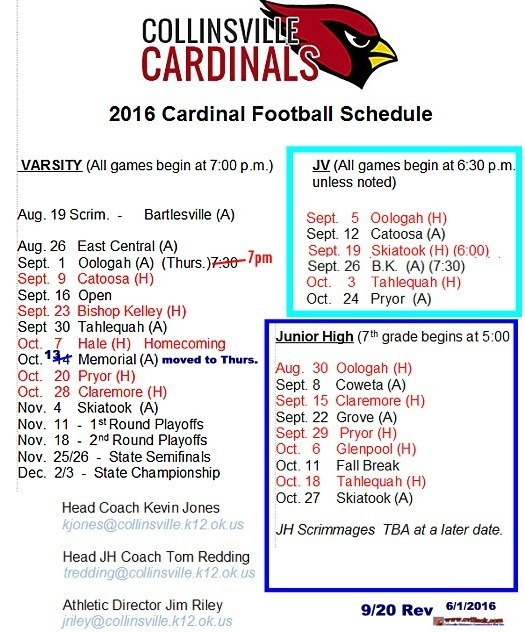 10/17/2012 Update: Collinsville played Claremore (here) in Sept. 1967 also. I've uploaded 42 photos from the Claremore at Collinsville Football game to the Tulsa World. They should have that slideshow available early Saturday morning. -- Ted 11pm Friday -- I'll get started on my cvilleok photo page early Saturday also.